The bottom of a Facebook phone supposedly coming from HTC later this week. 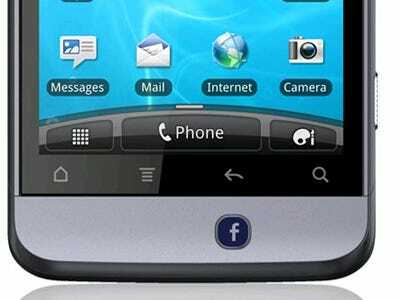 Pocketnow has published what it calls press shots of two upcoming Facebook phones from HTC. Both phones feature a small Facebook button below the screen, which would presumably launch a mobile version of the Facebook Web site or a dedicated Facebook app. The PocketNow screenshot also shows a modified version of the HTC Sense UI in which Facebook updates can be delivered directly to the clock app. Previous reports suggest that the phones will run a modified version of Android and will have minimal local storage. Instead, all photos can be automatically uploaded to Facebook as they’re taken — a feature very similar to the social-sharing features found on Microsoft’s ill-fated Kin phones. The HTC wouldn’t be the first Facebook phone — that honour goes to INQ, which introduced their phone with Facebook functionality a few days ago. Facebook may also be working on its own phone running a specialised version of Android.